Before the election, there are noticeable tensions in Osun. 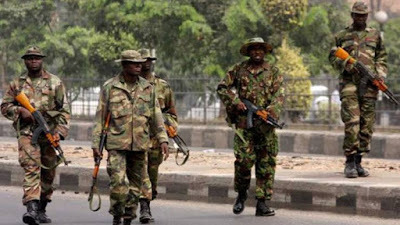 Our reporters watched a heavy military operation Wednesday morning in Osogbo, the capital of Osun and Ifon, in the local government of Orolu, while several other military vehicles moved towards Ile-Ife. The Foreign Minister is re-election to give the governing party leverage. We report that the decision is required by Saturday's unsuccessful gubernatorial elections at seven polling stations in the districts of Osogbo, Orolu, Ife South and Ife North. Meanwhile, there were charges and counter-accusations between the two leading parties in the competition, the ruling All Progressive Congress, APC, and the People's Democratic Party, PDP. While the APC accused the PDP of encouraging voters to buy PVC, it claimed that the ruling party had not bought PVC but had criminally cloned it to manipulate the electoral process to his advantage. Rup Aregbesola, who has recently defected to PDP, Alhaji Fatai Diekola, says the APC accused the APC of defeating and threatening some of its leaders.